KNOXVILLE, Tenn. – In front of a season-high crowd of 22,261, No. 1 Tennessee’s high-flying second half helped the Vols top the Florida Gators, 73-61, Saturday. Tennessee had four players score in double figures, with Grant Williams’ team-high 16 points leading the way to go along with a team-high six rebounds. 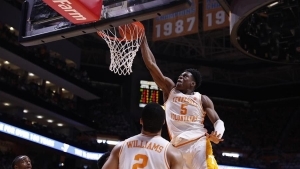 Admiral Schofield, who also grabbed six boards, finished with 14 points. The Vols pushed the lead to as many as 19 points when Jordan Bowden knocked down a left wing 3-pointer. The junior, who was fouled in the act of shooting, converted the and-one opportunity to make it 69-50 with 5:14 left on the clock.